The simple way to buy and sell Powersport Toys! Description: Scag SVR36A-19FX powered by a 19HP Kawasaki engine and a hydrostatic transmission with a 36" cutting deck. Runs and operates with 48 hours. CLICK HERE TO SEE A VIDEO OF THE ENGINE RUNNING. ALL UNITS ARE SOLD AS IS. Please click HERE for details prior to bidding. * Canadian Bidders: Please consult with your specific border crossing regarding the qualifications required for this unit to enter Canada. All bids close at the listed Bid End time (Central time), or 5 minutes after the last bid. This page generated at 4/23/2019 7:08:13 PM. Do you have questions about this item? 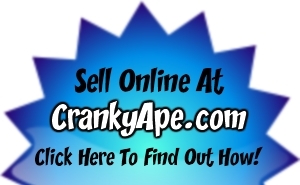 Contact CrankyApe.com Here! This Auction is closed. Please take the time to check out some of our other offerings. This unit does not follow our standard posted Transaction Fee Schedule. The assigned Transaction Fee is listed below. This is the Transaction Fee charged for this unit regardless of the final sale price. For additional information please visit our FAQ by clicking here.